Sustainability is a broad discipline, giving you insights into most aspects of the human world from business to technology to environment and the social sciences. Sustainability is the study of how natural systems function, remain diverse and produce everything it needs for the ecology to remain in balance. It also acknowledges that human civilization takes resources to sustain our modern way of life. We live in a modern, consumerist and largely urban existence throughout the developed world and consume natural resources every day. In our urban centers, we consume more power than those who live in rural settings and urban centers use a lot more power than average, keeping streets and civic buildings lit, to power our appliances, our heating and other public and household power requirements. It is estimated that we use about 40% more resources every year than we can put back and that needs to change. Sustainability and sustainable development focuses on balancing between competing needs - our need to move forward technologically and economically, and the needs to protect the environments in which we and others live. Sustainability is not just about the environment, it's also about our health as a society in ensuring that no people or areas of life suffer as a result of environmental legislation, and it's also about examining the longer term effects of the actions humanity takes and asking questions about how it may be improved. 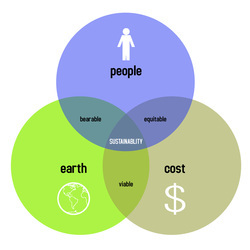 All systems can be viewed through the lens of sustainability. 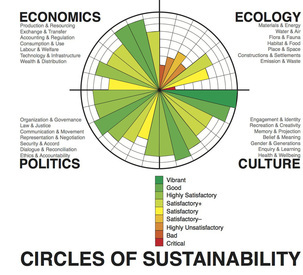 Environmental indicators and ecological footprints can be used to assess sustainability. What strengths and weaknesses of the systems approach and the use of models have been through this topic? 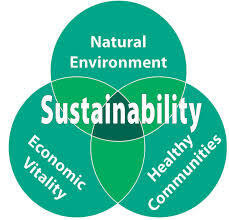 What have you learned about sustainability and sustainable development in this chapter? 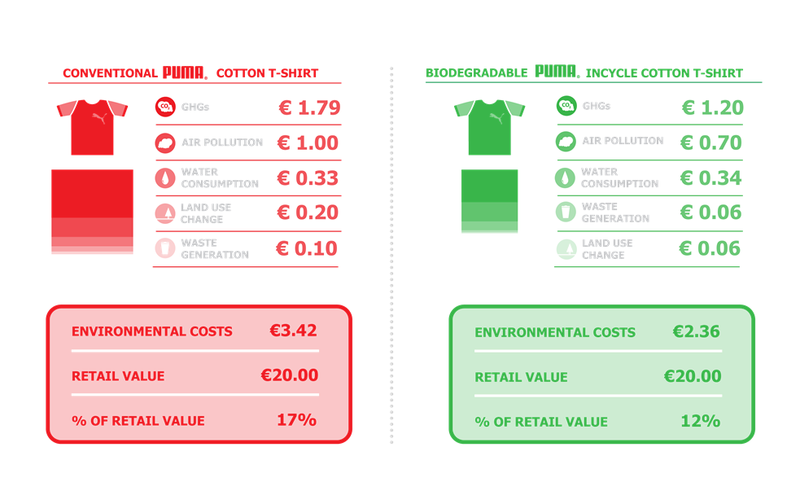 What are the differences between sustainability and sustainable development? How do EIAs ensure that development is sustainable? Environmental sustainability involves making decisions and taking action that are in the interests of protecting the natural world, with particular emphasis on preserving the capability of the environment to support human life. It is an important topic at the present time, as people are realising the full impact that businesses and individuals can have on the environment. There are three broad classes of natural capital. Renewable natural capital - living species and ecosystems. They are self-producing and self-maintaining. They use solar energy and photosynthesis. This natural capital can yield marketable goods such as wood fiber, but may also provide unaccounted essential services when left in place, for example, climate regulation. 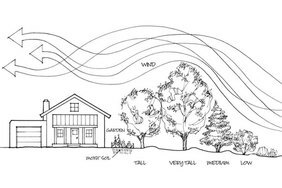 Replenishable natural capital - groundwater and the ozone layer, is nonliving but is also often dependent on the solar “engine” for renewal. Non-renewable capital - fossil fuel and minerals, are analogous to inventories: any use implies liquidating part of the stock. Renewable: solar energy, biomass energy, wind energy, hydro-power energy and geothermal energy. Any society that supports itself in part by depleting essential forms of natural capital is unsustainable. If human well-being is dependent on the goods and services provided by certain forms of natural capital, then longterm harvest (or pollution) rates should not exceed rates of capital renewal. Sustainability means living, within the means of nature, on the “interest” or sustainable income generated by natural capital. You need to be able to explain the relationship between natural capital, natural income and sustainability, and discuss the value of ecosystem services to a society. 1.4.U4 Ecosystems may provide life-supporting services such as water replenishment, flood and erosion protection, and goods such as timber, fisheries, and agricultural crops. Consider how cultural, economic, technological and other factors influence the status of a resource over time and space. 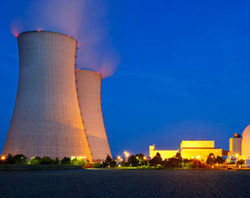 Uranium, due to the development of nuclear technology, has only recently become a valuable resource. Salt use to be more valuable than gold. What this all means is that resources are dynamic, its status may change, it might become valuable or it might become invaluable. The Millennium Ecosystem Assessment is a United Nations project designed to assess the consequences of ecosystem changes for human well-being. The objective of the multiyear exercise was to both assess the consequences of ecosystem changes for human well-being, and to establish a scientific basis for action to conserve the sustainable use of ecosystems and their contribution to human well-being. You need to be able to discuss how environmental indicators (such as Millennium Ecosystem Assessment) can be used to evaluate the progress of a project to increase sustainability. 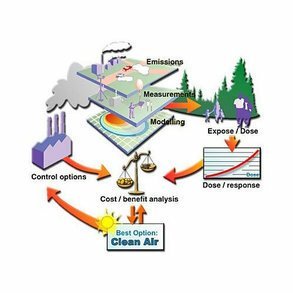 EIA involves production of a baseline study before any environmental development, assessment of possible impacts, and monitoring of change during and after the development. Process for identifying the likely consequence for the biophysical environment and for man’s health and welfare of implementing particular activities and for conveying information at a stage where it can materially affect the decision, to those for sanctioning the proposals. (long definition). The developments that need EIA’s differ from country to country, but certain types of developments tend to be included in the EIA process in most parts of the world. 1.4.U7 EIAs provide decision-makers with information in order to consider the environmental impact of a project. There is not necessarily a requirement to implement an EIA’s proposals, and many socio-economic factors may influence the decisions made. Screening - is an EIA required; what level of detail is required. Scoping - what are the issues and impacts of the project; who are the stakeholders; what is the current state of the environment. Identification of alternatives - what alternatives exist. 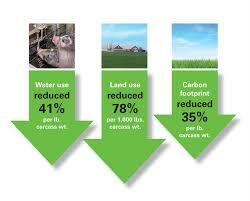 Impact analysis - what are the environmental, social and other related impacts of the project. Mitigation and impact management - how will the impacts be mitigated, reduced or managed. Evaluation of significance - are the impacts acceptable. Preparation of an Environmental Impact Statement (EIS) or report - documentation of the proposal, impacts, impact mitigation and management options, level of significance and concerns. Review of EIS - EIS is open for public comment for a sufficient period of time. Decision making - public comments considered and a decision made whether to accept the proposal as is, modify the proposal or reject the proposal outright. Monitoring and review - develop an implementation plan; begin monitoring and review of the project. 1.4.U8 Criticisms of EIAs include: the lack of a standard practice or training for practitioners, the lack of a clear definition of system boundaries and the lack of inclusion of indirect impacts. 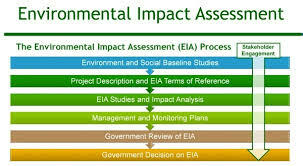 EIA has suffered much criticism over the years including criticism about: poor public consultation practices; poorly written reports; costly, inefficient and time consuming practices; limited scope; information understated or omitted from reports; EIA treated as a separate process and not integrated into the project cycle; lack of monitoring and review of terms set out in reports; and inconsistent application. The result is a lack of confidence in the EIA process by both decision makers and the general public. ​You need to be able to evaluate the use of EIAs. Criticisms of EIAs include the lack of a standard practice or training for practitioners, the lack of a clear definition of system boundaries, and the lack of inclusion of indirect impacts. The ecological footprint of a population is the area of land, in the same vicinity as the population, that would be required to provide all the population’s resources and assimilate all its wastes. As a model, it is able to provide a quantitative estimate of human carrying capacity. It is, in fact, the inverse of carrying capacity. It refers to the area required to sustainably support a given population rather than the population that a given area can sustainably support. 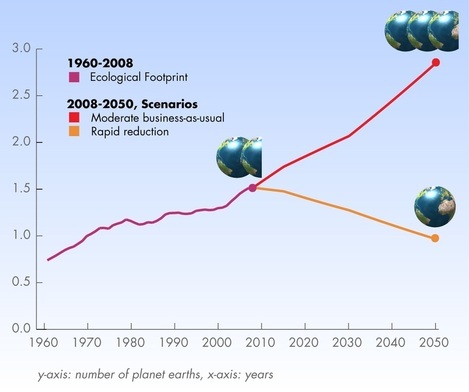 Ecological footprints are the hypothetical area of land required by a society, group or individual to fulfill all their resources needs and assimilation of wastes. As a model, it is able to provide a quantitative estimate of human carrying capacity. It is, in fact, the inverse of carrying capacity. It refers to the area required to sustainability support given population rather than the population that a given area can sustainably support. 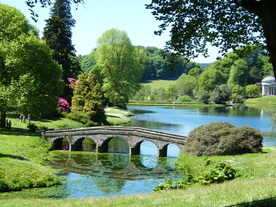 Natural capital refers to the source or supply of resources and services that are derived from nature. Forests, mineral deposits, fisheries and fertile soil are some examples of natural capital. Air and water purification are just two of many services. Natural Income is the annual yield from such sources of natural capital - timber, ores, fish and plants, respectively, relative to the examples above. The point at which the amount of natural income used up reduces the capacity of natural capital to continue providing the same amount of natural income in the future, is the point at which sustainable scale has been exceeded. Sustainability is the rate at which a resource depletion reduces the capacity of natural capital to provide the future natural income. As long as the draw down exceeds the rate of replenishment, the amount available will eventually shrink to zero - sustainability is destroyed. Sustainability allows you to focus at least as much on ecosystem services, and the natural income they provide, as on resources. Because natural capital is excluded from economic theory and practice, these vital, life supporting sources of natural income essential for sustainability, are considered to have no market value and are therefore ignored. 1.4.A2 Discuss the value of ecosystem services to a society. Ecosystems have value because they maintain life on Earth and the services needed to satisfy human material and nonmaterial needs. In addition, many people ascribe ecological, sociocultural, or intrinsic values to the existence of ecosystems and species. The Millennium Assessment recognizes these different paradigms, based on various motivations and concepts of value, along with the many valuation methods connected with them. Ecosystems and the provisioning, regulating, cultural, and supporting services they provide have economic value to human societies because people derive utility from their actual or potential use, either directly or indirectly (known as use values). People also value ecosystem services they are not currently using (non-use values). This paradigm of value is known as the utilitarian (anthropocentric) concept and is based on the principles of humans’ preference satisfaction (welfare). 1.4.A4 Evaluate the use of EIAs. EIA is not the only tool to achieve sustainability, the EIA process is still a very effective tool in evaluating the sustainability of development proposals. However, to measure the extent to which EIAs substantially address “sustainability”, the sustainability criteria must go beyond adherence to procedural requirements and address substantive considerations such as the sustainable use of resources, poverty and inequality. EIA provides an opportunity to learn from experience of similar projects and avoids the (often high) costs of subsequently mitigating unforeseen negative and damaging impacts. 1.4.A5 Explain the relationship between EFs and sustainability. ​Correct use of terminology is a key skill in ESS. It is essential to use key terms correctly when communicating your understanding, particularly in assessments. Use the quizlet flashcards or other tools such as learn, scatter, space race, speller and test to help you master the vocabulary. Environmental Impact Assessment General Procedures - A paper by Pacifica F. Achieng Ogola of the Kenya Electricity Generating Company Ltd. (KenGen). This activity is designed to help you better understand the concept of an EIA and the process by which it is carried out. EIAs incorporate baseline studies before a development project is undertaken - to what extent should environmental concerns limit our pursuit of knowledge? This is a spot created by CVF and sponsored by UNEP, to give visibility and make people understand what is the Millennium Ecosystem Assessment.